Our Range of Shower Seats and Stools are all designed to make your bathing experience more pleasureable and comfortable. 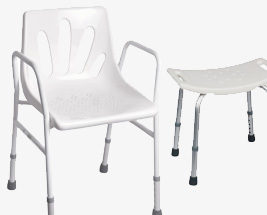 Within this range we offer a selection of Free Standing and Wall Mounted Shower Stools, as well as Stationary and Mobile Shower Chairs with Adjustable Height and Moveable/Detachable Arm options. Please browse through the products available as we have a number of sizes and styles of Shower Seats and Stools; to assist your selection we suggest that you use the search facility on the left.